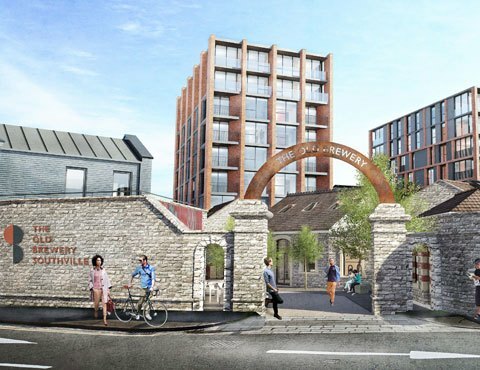 We’re delighted that Bristol City Council has given the green light and granted planning consent for the transformation of our site at The Old Brewery in Southville, Bristol, into new homes, co-working space and retail units. We’re now set to start work on the development, which will include 94 new homes, of which 16 will be affordable, 9 shared ownership, and 7 for social rental (2 of which will be 3-bed, 5 person houses). There will also be 2,000 sq m of co-working and commercial space. The Old Brewery, Southville, is being built on a 0.5 ha brownfield site between North Street, Ashton Road, Baynton Road and Durnford Street. It is the site of the old Ashton Gate Brewery and Thomas Baynton’s Brewery, and most recently home to short-term and underutilised warehousing space. Reflecting the vibrant and unique character of Southville, the design will echo the site’s industrial heritage. Existing buildings on the site with historical interest will be retained, such as the Bristol Byzantine Weighbridge House, the Gatehouse and its stone gate piers; some buildings such as the Brewery Manager’s House will be rebuilt; whilst new buildings will complement the heritage and design of the existing architecture. Ron Persaud, director at Change Real Estate says, “This is a hugely exciting development that is going to be a great addition to the characterful North Street. We hope the development will become a natural gateway from Ashton into Southville and an integral part of the community in Southville. “We’ve worked hard with Bristol City Council to agree a scheme that provides a mix of market and affordable housing in an attractive, courtyard setting, alongside co-working space which we know will be welcomed by start-ups and small businesses in this part of Bristol, who would rather work locally than travel into the centre of Bristol. The Old Brewery, Southville, has been designed by architects The Nash Partnership. It will be centred around two landscaped courtyards, the first linking North Street to other parts of the development, whilst the second will be a private, green, secure space for use by residents. Design of the public realm plays an important part within the Old Brewery, Southville, with pedestrianised areas, terraces, courtyards, as well as a strong focus on public art. Once construction is underway, it is hoped the development will be complete by end 2020. Anyone wishing to find out more about The Old Brewery, Southville, can visit www.oldbrewerysouthville.com, or contact Change Real Estate on 0117 407 0207. The Old Brewery MCC LLP is a joint venture between Change Real Estate and Cannon Family Office.